The refreshing fragrant blend of Lavender, Rosemary and Spearmint combined with skin softening olive oil. 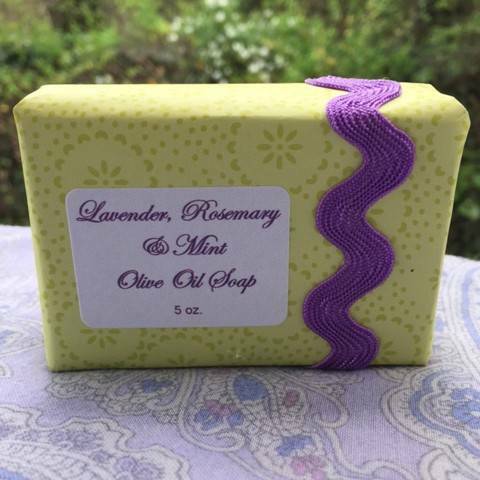 Wrapped in purple and green color themed packaging, this soap is perfect for gift giving or to display in your guest bath. Ingredients: Olive Oil (Grade A extra virgin), Palm Oil, Coconut Oil, Safflower Oil, Glycerine (kosher), Purified Water, Sodium Hydroxide (saponifying agent), Sorbitol ( moisturizer), Sorbitan oleate (emulsifer), Oatmeal Protein (conditioner), Lavandula Officinalis (Lavender 40/42), Rosmarinus (Rosemary) officinalis, and Mentha spicata (Spearmint) Essential Oils, Emerald Green Gel Colorant.